The book has themes that tend to be popular with children around the world - mischievous monkeys and an outing with a grandparent. The story embraces a kind of silliness that many very young learners will identify with. The writing is easy to read because of rhythmic repetition and correct word choice for the level. The illustrations are fun, and detailed enough to help the reader guess unknown words from the picture context. 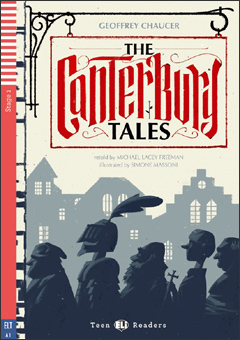 The Canterbury Tales is a well-written book with effective illustrations where the colorful characters stand out from the black and white backdrop. The limited new vocabulary makes this book a comfortable read for beginners who have moved into chapter books. This classic tale is written in a simple grammatical format that flows smoothly. Also, the person's name is used more often than the pronoun, which is helpful in understanding the story. The book itself tends to be a little long but it is divided up into different stories. The length should not be a problem for the higher level beginners. The Extensive Reading Foundation is a not-for-profit, charitable organization whose purpose is to support and promote extensive reading. One Foundation initiative is the annual Language Learner Literature Award for the best new works in English. Another is maintaining a bibliography of research on extensive reading. The Foundation is also interested in helping educational institutions set up extensive reading programs through grants that fund the purchase of books and other reading material.